Over the last few weeks Henry, Bandit and Skipper have been munching their way through the Feelwell's Probiotic range of treats - and it's safe to say that they all really enjoyed them! The Probiotic treats are available in four varieties - Puppy, Adult, Mature 7+ and Lite. Feelwell's Probiotic Treats are highly palatable, totally natural, hypo-allergenic dog treats with the added benefit of probiotics and have been formulated to help maintain a healthy digestive system. By giving your dog Feelwell's Probiotic Treats every day, you top up the good bacteria that occur naturally in their digestive system and help to maintain the necessary healthy balance and support their body's natural defences. Skipper was in charge of tasting the lamb flavour Puppy treats. 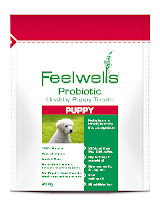 These are small treats which are suitable for all puppies from 6 weeks old. Being small they are an ideal training aid, and Skipper was very keen to work for them - he even managed to learn the 'down' command while working for these! He obviously loved them and they were kind on his sensitive stomach. The lamb Adult treats were just as popular with Bandit, his tail whirled round and round every time he saw the packet! Henry had a very difficult task - tasting two varieties! He enjoyed the Lite treats, which are only 5% fat and the Mature 7+ treats, which contain his favourite ingredient - Salmon! Take a look at the photos below and see if you think he enjoyed them! These Feelwells treats are lip-smackingly good! I did have three treats in my hand to show you the size of them - two disappeared. I don't know where they went! Henry is gorgeous! He looks like he really enjoyed those! My rescue springer Charlie has sensitive digestion (he had colitis when I got him, caused by stress), and he also gets a lot of wind!! He's 7 and a half now, so I'm thinking of starting him on the 7+ Feelwells, as my mum already uses these for her 8 year old rescue collie Fly, and they've made a real difference to her coat.